New hamster moms do eat their babies at times, a shocking and upsetting revelation for the human owners! Why do they do this? How can you prevent it? Read on to find out what my research has taught me about this. The key to preventing this from happening is to make the momma hamster feel as safe and secure as possible by not disturbing the natural process of birth and pup rearing. Remember that hamsters are unable to reason, meaning there is no evil thought process behind their choice to eat their young. Killing their pups is an instinctive natural process brought about by evolution. I know, easier said than done as we are humans and we tend to humanize other animals. I explain in more detail below to help you reach the same level of acceptance I now feel (well, mostly feel) when thinking about this whole process! When mama hamsters feel like their nest is insecure, they might eat their young to prevent a predator from getting them. While we know there is no predator lurking in the corner, our hamsters do not so they still act as if there could be. Hamsters become even more sensitive and wary of everything just before and in the weeks after giving birth. 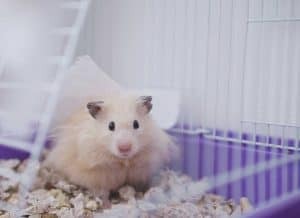 If your hamster has a nervous disposition in general or if she is a first-time mama, she is more likely to be affected by the stress and fear associated with giving birth and, subsequently, this could result in her cannibalizing her pups. Stress in the later stages of pregnancy can also lead to a hamster eating her pups, so as soon as you suspect your hamster is pregnant you should reduce her stress. Reduce the stress and fear your mama hamster feels by making sure her cage is in a quiet, vibration and disturbance-free area. 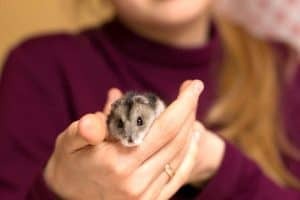 It should not be located near a door or a window where she will constantly see movement or located on a wall with a TV or sound system attached to it (either in the same room or in an adjacent room) as this could cause additional stress for your hamster. Avoid handling the mama hamster once she begins to show (around 10 days) and do not handle her again until the pups have been removed from the cage. Now for the most difficult piece of advice…you need to avoid spending extra time around the cage, taking pictures of the babies, and acting excited around your mama hamster. You should only be around the cage when absolutely necessary for the first 10-14 days, and you should not have any visitors around the cage until the pups’ eyes are open. Baby hamsters are born hairless, blind, and deaf. They are completely dependent on their mother for all of their needs. The mother hamster is nearly blind too. You can read more about that in our post about What hamsters can see and hear. She depends on her sense of smell to identify her pups and properly care for them. If you hold or pet a baby hamster it will take on your scent which could confuse the mama hamster. Often times the mama hamster will connect your scent with feeding and therefore believe her own baby is food placed in the cage by you. This would lead to her eating the baby so that she can properly care for the rest of the litter. Do not place your hands on or near the cage once you suspect the mama hamster is pregnant. Avoid touching or handling anything that goes into the cage with your bare hands. Invest in some powder-free rubber gloves to use when delivering food or water to the cage for the first couple of weeks while the babies mature, and the mother adjusts to her new role. Mama hamsters are very focused on the good of the group, this begins with her own health and trickles down to her new pups. If there is not enough food or water available for the mama hamster and her pups, she will begin eating the smaller and weaker babies to avoid starvation for the entire group. If the mama hamster feels that the litter is too large for the nest (or cage), she will reduce the size of the litter so that they all comfortably fit. Along with that same line of thought, if the litter is larger than the mama hamster believes she can properly support she will choose to reduce the number of pups for the good of the group. Always make sure the cage has enough food and water for the mama hamster and the pups. Sprinkle food around the cage so that the mama’s natural foraging instinct is satisfied and so the pups can learn to forage when they are old enough. Consider providing the new mama hamster with extra protein, this could be as simple as adding a boiled egg to the cage or sprinkling her usual food with fish liver oil. When a mama hamster gives birth, she might feel weak and tired and eat the closest thing she can find to help replenish the nutrients she needs. In addition, if the mother hamster is ill when she gives birth, she will prioritize taking care of herself over taking care of her litter, leading to cannibalism of the pups. On the flip side of this theory, if a pup is born sick, abnormal, or if the pup is not developing properly the mama hamster will often reject the pup and focus on the ones with the best chance of survival. Since she has deemed this rejected pup is not going to live anyway, she consumes the pup to help her have the nourishment she needs to care for the rest of the litter. This is the hardest reason to protect against since it is difficult to tell if a mama hamster is ill or if she is going to reject one (or more) of her pups ahead of time. Often times, once you realize there is an issue, the mama hamster has already dealt with it herself. Keep your hamster in a quiet area before the birth and while the babies are young. 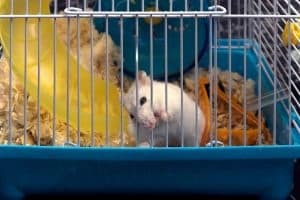 Avoid touching your hammie or the cage – and use gloves when you have to. Make sure the mama hamster has enough quality food and water. Make sure the cage is large enough (always a good idea: read more about cage size here). Hope for the best and don’t blame yourself (or your hammie!) if the worst happens. It is helpful to look at the entire animal kingdom when trying to come closer to understanding and sympathizing with mothers that eat their young. I am not suggesting we will ever accept this practice, but I am saying that understanding an animal’s natural instincts makes accepting the animal easier. In nature, there are many different animals that eat their young. This occurs with polar bears, pigs, birds, primates, some fish species, and different types of bugs. There are many physical and environmental advantages to animals cannibalizing their babies, this includes satisfying their own energy or nutrition requirements and reducing the stress to the mother. In addition, there is such a thing as a mercy response that is ingrained into the DNA of some animals. This includes the ideas of sparing underdeveloped or flawed babies from predators and sparing babies from starvation. Basically, just keep in mind that these are natural instincts and NOT your fault. You can reduce the risk of a mama hamster feeling like this is a necessary step to take, but you cannot take away her innate behaviors which were developed and designed to propagate the survival of the species (or as we often refer to this, survival of the fittest).